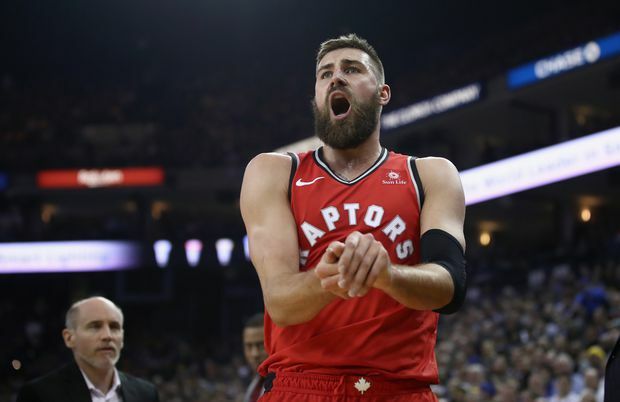 Jonas Valanciunas of the Toronto Raptors grimaces in pain after hurting his finger during a game against the Golden State Warriors on Dec. 12, 2018. Toronto Raptors forward Jonas Valanciunas underwent surgery to repair a dislocated left thumb and will wear a cast for four weeks. Valanciunas suffered the injury in Toronto’s 113-93 victory at Golden State on Wednesday. He had surgery at Stanford Medical Center in Palo Alto, Calif., and will be re-evaluated at a later date. The Raptors have called up forward Chris Boucher for Friday’s night’s game at Portland to bolster the frontcourt. The Montreal native, who is on a two-way contract with the Raptors and their G League affiliate Raptors 905, is coming off a franchise-record 47-point performance against the Oklahoma City Blue on Wednesday. The 25-year-old is averaging 29.3 points, and 11-plus rebounds a game with Raptors 905. He’s also appeared in three games with the Raptors this season. Valanciunas is averaging 12.8 points, 7.2 rebounds and 18.8 minutes in 30 games (10 starts) this season. He has led the team in rebounding 11 times, and recorded five double-doubles.